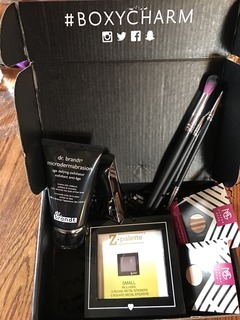 Another month means another BoxyCharm! I loved this month! The mini Z-palette holds 9 shadows and came with the extra magnets in case you need them for other shadows. The brush set is beautiful with an ombre look. The lipstick was the only miss for me as I just don't wear bright red that much and I have so many from beauty boxes. This box is all FULL sized products and the retail on this box is $164.95!!! You just can't beat boxycharm - full sized products makes all the difference to me. I would never had bought the Dr. Brandt but I'm thrilled to have it to try and at the low cost of $21 I couldn't have gotten such a high end skin care item. ARupLife.com DID NOT receive product, press or compensation to facilitate this review - this product was purchased by ARUPLIFE.com. This post may contain affiliate links. We only give our honest opinions of products. This post is in accordance with the FTC 10 CFR, Part 255 concerning the use, endorsements or testimonials in advertising.